Like many of my #citylis classmates I’ve spent much of the past 2 months writing essays, with the remaining time spent prevaricating or indulging in some festive fun. This is what scholars do. Our job is to read widely, appraise critically, synthesise astutely, ferment wisely, distil succinctly and communicate clearly. Perhaps this is why we are always going on about coffee and alcohol too; we recognise and appreciate other alchemic crafts. Each publication is our craft brew of ideas. I know people generally think students are ill-disciplined wastrels. However, most of my colleagues are either working and studying part-time as part of their professional development or they are studying full-time as an career switching investment whilst juggling their family commitments. No-one wants to squander the privilege of being able to advance their knowledge, gain a qualification and have access to some of the best tutors and literature sources in the business. Juggling the ideas, research and writing for four courses during the same period is a difficult mental challenge. It’s been hard work and downright stressful at times. Sometimes it comes easily, sometimes you think I’m never going to finish this. It took me a while to find my rhythm but now I’ve found a routine that works for me and once established have been disciplined about sticking to it. I work on average 5-6 hours a day, every day including weekends. That work includes information scanning, reading, writing and ‘busy work’ in that order. I run and do yoga to rest my brain and eyes and make sure my body doesn’t seize up from too much sitting at a desk. My guilty pleasure is watching Escape to the Country with a cup of tea in the afternoons. Most importably I rarely skip second breakfast. One of the things I want to carry into Term 2 is that routine. Now that we’ve experienced a whole term cycle and its demands you get a better feel for the pace of work. Most classmates have been commentating on the perils of procrastination and the pressures of deadlines. One of the maddening things about research is the more you read the more you realise there is to read. Sometimes hours can pass and you realise all you have done is collect even more things to read. No actual reading. Certainly no writing. If only they offered a Masters of List Making. Next time of course it will all be different. We will likely still procrastinate. Sometimes it’s a genuine avoidance tactic; sometimes it’s what you might call a sorbet for the mind. A cleansing activity between more demanding work phases. Sometimes you need to step away and stop hammering at a problem to allow your sub-conscious the opportunity to ease the passage of stubborn thoughts. Sometimes it’s a sign of tiredness and a signal to take a break. Part of learning is understanding here are always areas for improvement to look for and thinking about how you will at least try to do some things slightly different next time. One of mine would be to plan better to allow more contingency for ‘off hours’ and ‘off days’ to make sure I’m using energy wisely and not wasting too much attention and to lessen the despair when a session feels like no progress has been made. I now know how much effort on average it takes me to write an essay of around 3,000 words. I also know from my running training that periodisation is important and I organise my running into micro, meso and macro cycles to balance effort and optimise performance. I want to think across the whole term and plan a framework for my intellectual activities in the same way. I also want to write more regularly. I found with writing essays the hardest part is always getting started. Sometimes you just have to sit and write and perhaps that will be easier if writing becomes a habit. Last term we had our DITA blogging to practice writing and I’ll continue to blog. To this I want to add more time spent writing reflective notes after reading important sources and putting more words in towards assignments more regularly. One of the things that’s really helped me with this is buying Scrivener and using it to collect my research, structure my ideas and write my early drafts for each writing project. 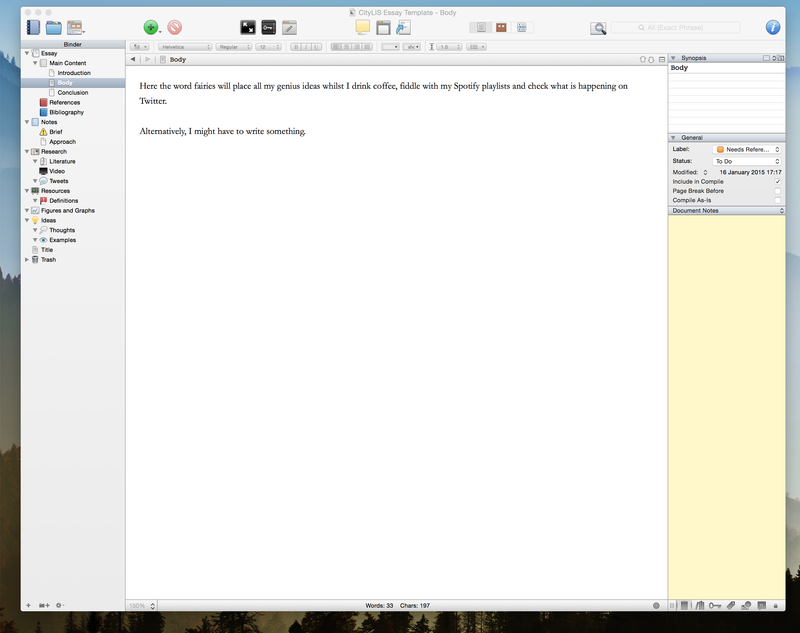 Scrivener is a data and a writing tool that provides a full studio with many features for writing projects. 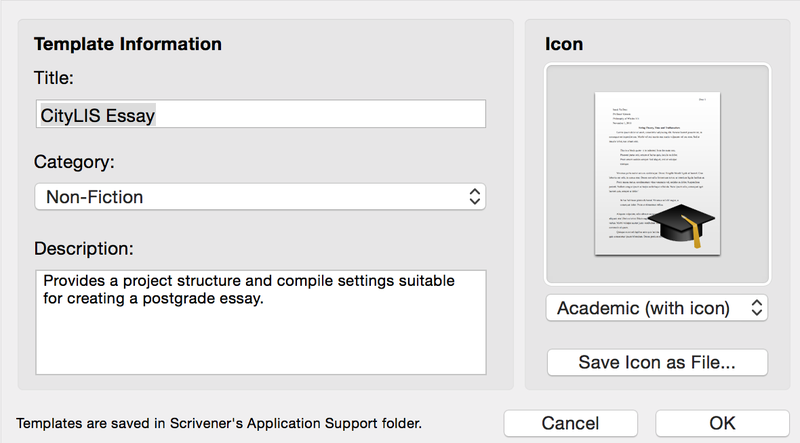 Early this term I want to explore Scrivener more to learn more about its features and take more advantage of it. I could improve how I combined it with Zotero for my references and understanding the formatting options so I don’t have to do so much final formatting manual. I’ve started a CityLIS template to store my settings and I’ll want to refine and enhance this before writing my next set of essays and the Big D.
Sitting down to organise my thoughts and start writing has definitely been easy with Scrivener and it joins Zotero and Evernote as an essential in my research toolkit. I still love Zotero as my collect, curate and organise tool for research. 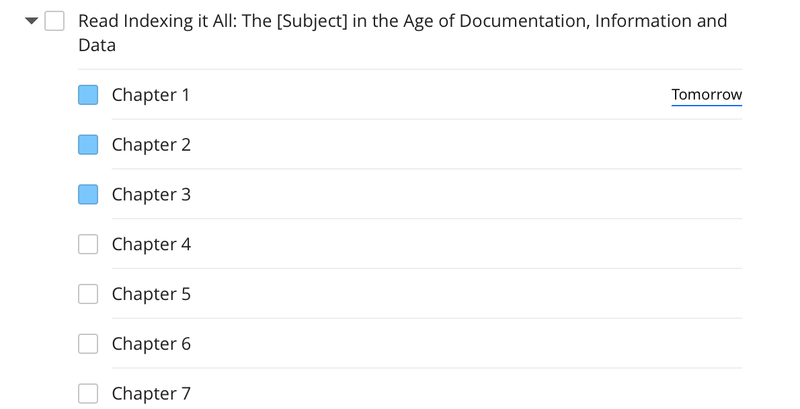 I’ve started to think about how I can improve my Zotero habits to work better with the kind of research I’m doing now. I’ve been using collections more to support early assignment research and then selection of sources. I’m using their colour coded tags to indicate which resources are read, unread, to read and have been cited. I’m also using tags to record how deeply I’ve read a source. Have I done a quick skim (mostly), a deep read (some) or a full critical appraisal (hardly any unless you have to write an essay on such a thing). Zotero allows up to 6 tags to be colour coded and assignable using numbered shortcuts. This makes it easy to see what I’ve not read, what I want to read next, what I have read and what I’ve cited. Zotero is based on the idea of index cards (remediated practice!) so I’ve also started using standalone notes to capture concepts and definitions and put more effort into connecting related items to each other. Of course these kind of good habits do get neglected the closer you get to a deadline so now is a good time to try and get these habits embedded and tidy up both my Zotero library and my overflowing Evernote shoebox of interesting things I’ve saved. Another thing that really worked for me was breaking work into smaller tasks. This does help with procrastination and organising a schedule. ‘Write essay’ is a really had task to get going with. The activity is too vague, the reward to far away. Humans are just not psychological equipped to work with this. I’ve been using Todoist to manage my tasks for a while. One of the reasons is because it allows sub-tasks. Along with priorities, tagging and easy scheduling it’s really easy to organise both macro tasks and an action list of micro tasks to work through each day. I’ve now got a template ‘Write Essay’ task for each essay structure that includes the main phases to work through to which I add specific tasks under that. For everything I want to read I add it as a Todoist task. For books I add each Chapter as a sub-task. Latterly, once I’d worked out my outline structure I started adding write section tasks underneath a write First Draft task. Write 250 words would also work. Yes it does take a bit of time to make everything actionable. I told you I would get a Masters in List Making. Yet, there’s nothing that beats procrastination better than checking of a task. Bing! Stuff read. Bing! Stuff written. Yay! 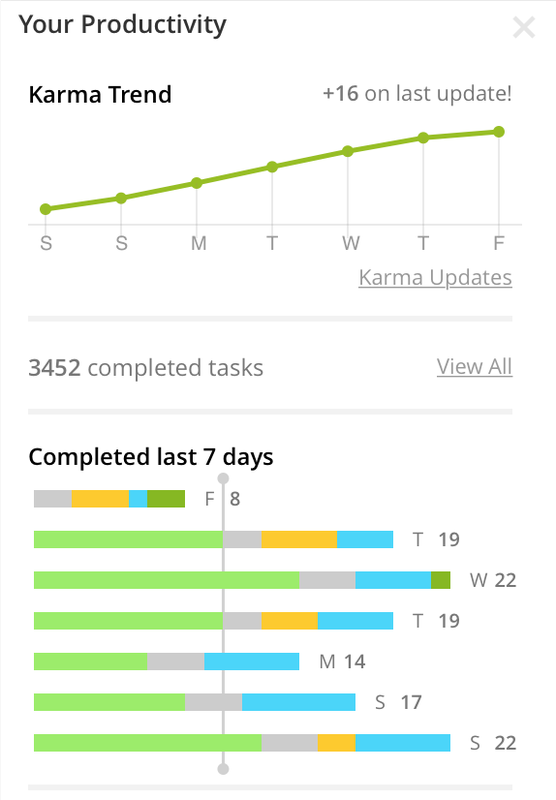 Todoist also adds a bit of gamification by giving you karma points and graphing your productivity trends. More than this I did find it comforting at the end of each work session to have a clear idea of what I was going to work on in the next session by adding priorities and scheduling tasks. Be realistic though if you look at your list of things to do today and it’s a dauntingly long then you and procrastination are just going to hang out a bit longer because where to you start with that? Karma! Karma points for actioning tasks Todoist allows you to keep track of your productivity. Colour coded projects help to make sure your directing your attention at the right areas or balancing your attention correctly across projects/priorities. Anyone would think I had a deadline this week. In Term 2 citylis core modules now vary between the MA/MSc in Library Science and the MSc in Information Science and there is one elective choice so our happy cohort will mix up a bit. this term I will be learning about Information Retrieval, Information Resources and Organisation, Information Domains and hopefully Data Visualisation once the electives are confirmed. I’ll continue to write more generally in this blog along the way and am hoping to extend my DITA blog to cover topics in Data Visualisation which will be my most techie Term 2 module. In the meantime I’ve bought some new running shoes in the sales to celebrate getting to this point and I like forward to breaking those in. It’s time to enjoy a few days rest: drinking wine, sleeping, catching up on the news, tackling on the pile of domestic chores that have built up on the wayside and dipping into the pile of books I’ve accumulate that are in various states of ‘readness’ are all on the agenda. I also need to catch up on Last Tango in Halifax! Then onwards to Term 2 which begins on the 26th January. This week in our Research, Evaluation and Communications Skills class this week the emphasis was very much on communicating. We we asked to think about good and bad writing and presentation styles and think about our favourites writers and presenters. We were also asked to think about what we liked and disliked about writing and presenting. This was an interactive session with lots of great ideas and input. By the end of it I was thinking about how I could put together a motivational guide for myself based on the good advice discussed in class and by reflecting on my own previous practice, not just in writing and presenting, but also drawing on my training programmes from my time as a hockey player and now a runner and project work. Beat prevarication by aiming low. At the start you think it will be hard knowing what to put in: by the end you realise it is harder deciding what to leave out. Still that blank canvas is daunting. One thing I’ve learnt from my running is it’s sometimes best not to think about the end, just think about the next step. The prospect of training enough to finish a race can be so nerve wracking it becomes dispiriting. Instead in my running I initially try and concentrate on why I run not how far or how fast I am running. I think about beautiful trails and fresh air; clearing my head and feeling energised and healthy. I tell myself to just get out and do a little bit every day. If I felt like stopping after 500m I could but at least I would have started. Once out I nearly always run further than I think I will but the key to running consistently for me is not to put pressure on myself by thinking a run isn’t worthwhile if it isn’t what I planned. Anything will help. When I join several runs together and train consistently I get fitter without even noticing and enjoy the process much more than when I focus on targets. Like running, writing and presenting are not just skills they are habits, and forming good habits is hard. The hardest part, however, is the first step. Once you’ve got going you have momentum so to get going I tell myself to sit down for each study session and write not much of anything to begin with and go from there. I always write more than I think I will. Find an authentic voice by using a style that suits you and your audience. Adapt your persona to suit your audience but be sure that persona is still true to you. There is no best way if doing it that way makes you or your audience feel uncomfortable. There is no bad way unless it distracts from what you are saying. As long as you are enthusiastic about what you are trying to say your audience will likely be engaged. The same is true for running. Go running and you will see hundreds of people and hundreds of different styles. Some look incredibly uncomfortable, others look as though they are flying over the ground. You also can’t sprint a marathon or jog a sprint. There has recently been a trend towards minimalism and more ‘natural’ running styles in the running literature. This has come from the idea that there is a best way to run and it’s based on their way our ancient ancestors ran hundreds of years ago. It has become the new evangelism in running. It has led to a wealth of self-help guides encouraging people to adopt their running gait from heel strike to midfoot strike without there being much evidence that one is universally better than the other, It has also seen running shoe fashion move towards shoes with less cushioning and a lower to the ground structure. For many it might have brought them more strength, less injuries and better running. For others it has brought the opposite either because such a style doesn’t suit them or their running or they have attempted to transition too fast. You cannot go from one style to another in a single training cycle but it doesn’t stop people trying. So the literature is filled with more research and opinions for and against with the end conclusion usually being the best style is the one that works for you, by keeping you injury free and healthy, rather than prevailing fashion. Stay strong, be flexible, wear simple and comfortable shoes that don’t use too many gimmicks. Build confidence by practicing regularly. One of the reasons I am trying to blog more at the moment is because I know at the end of this year I will have to write a dissertation. A dissertation is maybe like a half marathon of writing so can’t be entered into lightly. It needs preparation and practice to even finish never mind do well. Preparation for a race will likely include following some kind of training plan that will aim to build fitness gradually over time using periodisation. This involves varying your training over long and short cycles and organising it into phases so start with shorter easier tasks and culminate in more race specific tasks before tapering towards the end so you will feel fit and fresh. Writing and presenting are kind of the same. They involve a period of researching and playing with ideas and notes. Maybe organising those thoughts into more of a structure and fleshing them out into a first or second draft. You’ll research the point where’ll you’ll need to start taking things out rather than going longer and spend some time away from the project before going back and reading it through and polishing it. Finally you will publish or present it. This all becomes a lot easier if you do it regularly. Runners have maintenance phases so writing and speaking in front of an audience whenever possible will help find or maintain your communication rhythm and style between formal projects. This is one of the reasons I’ve started to blog more and write about the weeks: I’m hoping my communication ‘fitness’ will improve and things will be slightly easier for being familiar when more formal assignments come along. I also know from running that the sessions I find the hardest and most dread are often the ones that leave me feeling most exhilarated and motivated to continue afterwards. So just keep trying. Simplicity – the art of maximizing the amount of work not done is essential. One of my biggest problems is knowing what to leave out and when to stop. I don’t like to let ideas go so I squeeze them in until they have no room to breathe. It is difficult leaving out painstakingly excavated research and carefully crafted words by the wayside so I tinker … but less is often more. I got better at changing my mindset so I could tame my inner perfectionist and accept good enough more often once I had worked on some agile software projects and learnt about iterations and definitions of done and thought about my work in terms of releases and continuous improvement and quality in terms of fitness for purpose. To author agile I: allocate effort, rapidly revise work,spend more time taking things out than putting things in, leave incomplete features on the back burner for future releases then stop. It may not be perfect but it will be fit for purpose. Most people most of the time won’t notice the difference between good enough and great and will forget about the bad but you’ll notice, and get exhausted by, how much more effort you have put in to achieve the finality you crave. So just ship it. Once it is done it cannot be redone or undone so by all means reflect but move on. Next time is waiting.